Some accessory styles never seem to go out of vogue. They may enjoy a renaissance every now and again, but they're never truly unfashionable. So while a purse like the Libby might seem particularly on trend as we all try to emulate the Mad Men look, it'll become a wardrobe staple long after the vintage fad has passed. We've seen many similar purses in the past, but few have the Libby's attention to detail. Its leather is lovely, whether you choose a matte or patent. I'm particularly impressed that Hobo International's used it to cover the frame, creating a seamless, unified design. The circular clasp is like a little cherry on top, capping off what is a very stylish vintage-inspired number. Its interior is simple but sufficient, with a slip pocket for a cell phone in the wall. Those girls of the swinging sixties never needed their handbag to accommodate technology, but Hobo International knows we do! It also appreciates that hand-held clutching is a bit of pain, so provides an optional carry strap. I really like this mustard-yellow citrus shade, but it's far from our only choice. In fact, Hobo International spoils us with 11 different color options. You'll find each one priced at a relatively inexpensive $68. That's a small price for such a timeless design. 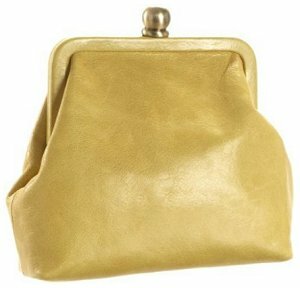 The Hobo International Lauren bag, a great alternative to this framed clutch bag.